It was 1 November 866 when the Vikings first invaded the Anglo-Saxon town of Eoforwic knowing that the local residents would be in church -without their weapons – celebrating the feast of All Saints. Today, three brothers – Halfdan Ragnarsson, Ubba Ragnarsson and Ivarr the Boneless – returned to the city to start the countdown to the next Viking invasion – the JORVIK Viking Festival 2018, which runs 12 – 18 February 2018. JORVIK Viking Festival is the largest Norse-themed festival in Europe, regularly attracting over 40,000 visitors to the historic city of York, and this year, the festival returns to the roots of the Vikings, telling the story of how their fearsome warriors first arrived in the Anglo-Saxon town, before settling and creating the city of Jorvik, the capital of Viking-age England. Leading the charge in 2018 as in AD866 will be the three warrior brothers – Halfdan and Ubba Ragnarsson and Ivarr the Boneless. 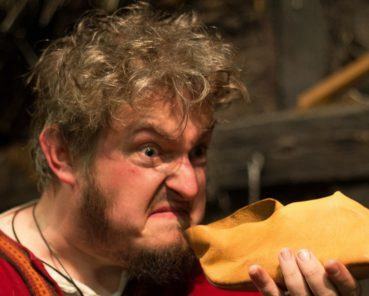 “This is the first Festival since the JORVIK Viking Centre re-opened last April. Whilst the story we tell within the attraction focuses on the peaceful trading hub that Jorvik had become nearly a century after they first invaded, this year for the Festival, our hordes of Viking warriors will face off against the established Anglo-Saxons as we tell the ‘origin’ story of Viking York,” comments marketing manager, Paul Whiting. Entitled ‘Invasion: The Dawn of Viking York’, the 2018 Festival will feature many of the Festival’s trademark events, including the call to battle as the Viking hordes march from York Minster to Coppergate, a column of fearsome warriors stretching from one end of the city centre to the other (Saturday 17 February, from 1pm). 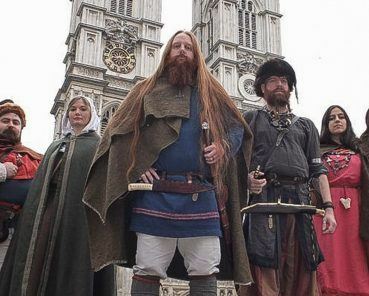 An encampment will run for the duration of the festival in Parliament Street, enabling visitors to get up close with the Vikings on the move, learning what they traded, the clothes that they wore and the sagas they shared around the fire. The ultimate search for a Viking warrior returns to Coppergate Square on Saturday 17 February, with the annual Strongest Viking Competition – a mix of brute strength, bravado and bluster that thrills and entertains the crowds. For those seeking to mix drama with a full belly, visitors can join the Great Viking Army Banquet on Friday 16 February as they celebrate conquering the North – and few armies throughout history have been quite as infamous for their celebrations as the Vikings! World-renowned musician, Einar Selvik-Wardruna – whose music features in the TV series, The Vikings – will return for a concert in York’s Tempest Anderson Hall on Friday 16 February. Bringing the Festival to a close will be the ultimate Festival Finale – a thrilling live-action battle, combining son-et-lumiere with pyrotechnics and an incredible battle-royale, where the stakes couldn’t be higher – the very future of the British Isles. A cast of over 100 warriors takes to the Eye of York, in the shadow of Clifford’s Tower, for this ultimate commemoration of the Viking invasion which lay the foundations for the next 200 years of prosperity for the city. 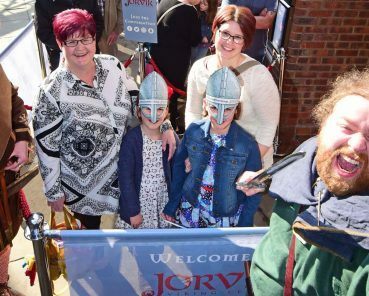 Full details of all of the events in this year’s JORVIK Viking Festival are available online here. JORVIK Viking Festival is organised and funded by York Archaeological Trust, a registered charity. Many events offer free admission, but admission fees are payable for some of the larger highlight events. The Viking invasion of York is thought to have been spearheaded by three brothers from the Ragnarsson family, Halfdan, Ubba and Ivarr, known as Ivarr the Boneless. Son of Ragnar Lothbrok and one of the leaders of the Great Viking Army. He was described as ‘boneless’ due to the high probability that he had a genetic condition, osteogenesis imperfecta causing bone deformations. Another theory is that it is a mis-translation of Hated (ex and os in Latin) but the majority of the Sagas mention his disability, so this seems a more likely explanation. First Viking King of Northumbria and claimant to the Irish throne in Dublin. A commander of the Great Viking Army – the youngest of the three, but still a formidable warrior.